Oh, dust. How I loathe thee. As I’m sure is the case not only for many toy photographers, but macro photographers as well, dust can be a formidable opponent, and can even ruin otherwise perfect photos. 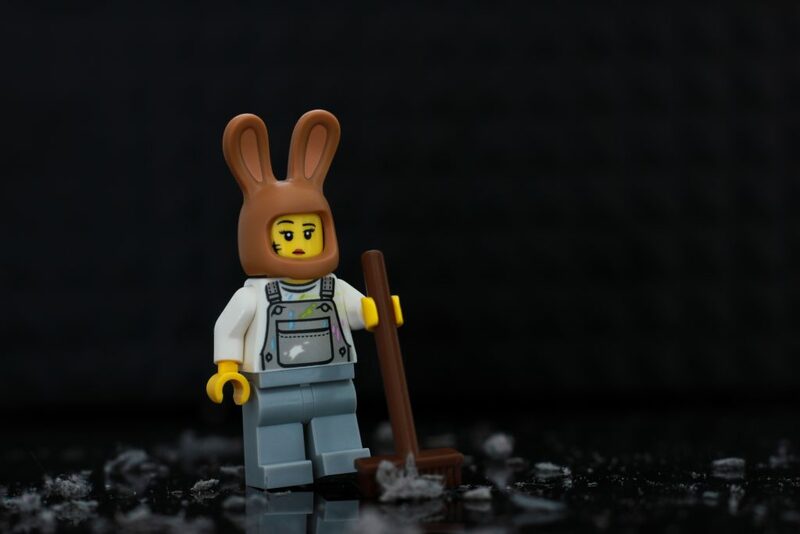 One missed spec on a minifigure’s shoulder runs the risk of distracting the viewer and drawing unwanted attention. Of course, the level of dust frustration will vary depending on the photographer and on the viewer. For me, it’s often a deal breaker, causing me to either spend an exorbitant amount of time spot-cleaning the dust in Photoshop or Lightroom, or simply scrapping the initial photos and trying the whole setup again. Over the years I’ve become better about checking for dust before taking any photos. However, I’ve found that, with something like LEGO as a subject, it can often be hard to get all of the dust I want. Those little plastic minifigures have more nook and crannies than an English Muffin! I never found much success with feather dusters, and while something like a microfiber cloth can help remove unwanted dust from my surface or some larger pieces, I needed something that would be versatile enough to get into all the little corners I needed. Plus, I didn’t want to spend too much time dusting. When creativity hits, you have to strike while the iron is hot! Dusting for too long can become frustrating and kill the mood. That’s when my wife came to the rescue. My wife is a makeup enthusiast, and had the brilliant idea of using makeup brushes to solve my dust problem! Luckily for me, she had a few that she thought would best fit my needs. I’m sure there are a wide variety of makeup brushes out there that will do the trick, but these are the three that she recommended. The E.L.F. small stipple brush has bristles that are long, but not too dense, meaning I can cover wide areas without running the risk of knocking pieces over. The Morphe E40 Eyelash Fan does wonders in the little spaces where a minifigure’s arms connect to the torso or where the hands click into the arms. Its bristles are small, but dense, giving you a lot of power in a small package. 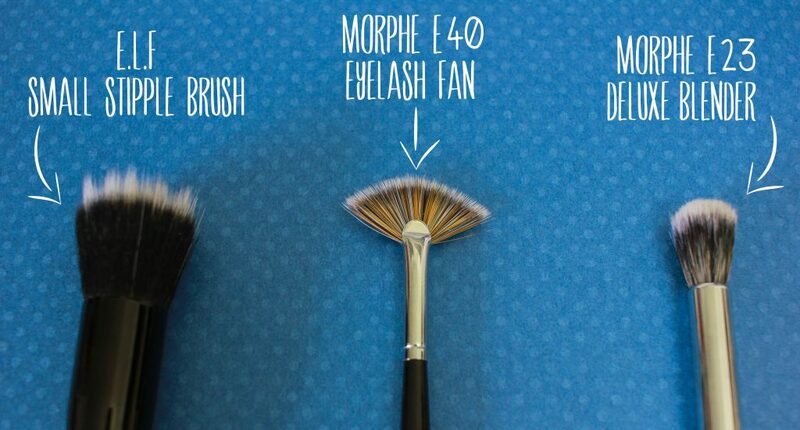 The Morphe E23 Deluxe Blender brush is my favorite of the three. I find that it’s good for all-around dust removal, and has a nice thickness that allows it to pick up a lot of dust easily. 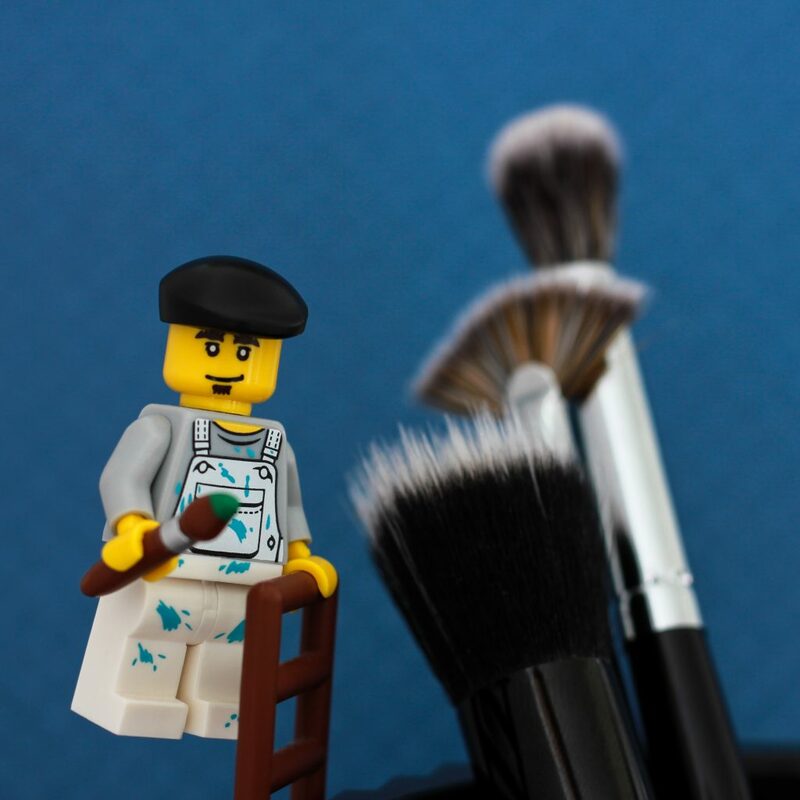 The makeup brushes are easy to throw in a camera bag if you’re on the go, don’t require much maintenance (I like to rinse them off after each shoot, to avoid dust buildup), and are perfectly sized for LEGO minifigures or toys! And best of all, they’re super affordable. The most expensive of the three (the E23) was $7. If you or your loved one have some makeup brushes lying around, give them a try, and keep those pesky little dust piles away from your meticulously staged toy photos. How do you feel about dust in toy photos? Is it a problem you’ve struggled with or something that distracts you? What methods have you found to help solve the problem? I just blow on my figures when it’s too obvious… Then if the photo is worth it I quickly clean it in Lightroom, or Photoshop if it’s too tricky and I really want to get rid of the dust, dirt and other marks of time. I kind of gave up trying to get rid of the dust/dirt because my figures get always dirty anyway when I go play outside with them. The most recent example was Aria, my CMF 17 Butterfly Girl, who was as dirty as my 15+ years old Yoda figure after only 2 days. As helpful as the brushes are, I often forget to use them, believe it or not! I blow on my figures too if it’s something small, or if I’m shooting outside and forgot to pack my brushes. And yeah, I remember Kristina’s post! I like to keep the wear and tear in the photos as well. As you said, keeping the signs of time can add a lot to a photo. Ooooh, great idea on chopping them down. You’re not alone, I HATE dust on my pictures and will often spend an exorbitant amount of time in post-processing, zooming waaaaay in even though most people probably wouldn’t notice. I love that your solution came from Jordan’s stash of brushes. Often times a problem can be solved by purposing things in a new way. I’ll keep this in mind when I’m photographing my jewelry. Cheers to you both! Love this series of pics. This is a great post James! I think having a few brushes around is probably a good idea. I cant imagine packing them in my camera bag, but I can totally see using them in studio set ups. When Im outside its all I can do to keep the hair straight, move fast with the changing light and keep the pine needles out of the photo. If I added one more step, I would loose the moment. Plus I like the scrapped up look of my outdoor figures. But indoor is another beast all together. When I did the city series for LEGO the cat hair and dust on all that plastic drove me crazy. I wonder if the aesthetic of a studio photography isn’t more demanding of this type of perfection? Plus with all that controlled lighting, you have all the time in the world to focus on small details like dust and cat hair. Whatever the answer, the more tricks in our bags, the better prepared we will be for any situation! I look forward to your next post! Thanks, Shelly! I know exactly what you mean about the fast paced, “fly by the seat of your pants” kind of shooting that happens outdoors. I can’t tell you how many times I’ve taken my photos into Lightroom only to hate the specs of dirt or little tiny hairs (where do those even come from??) I didn’t notice at the time. Thanks, Julia! I too spend a lot of time in post, sometimes even after using the brushes. It’s not a perfect system, but it certainly helps! I’m right there with you James, and having a pet in the house means little hairs as well. Being a macro shooting boy from a long way back I always have a brush close at hand. However, I’ve not thought much about what type to use. Thanks to you and your wife for the tips. Cheers, Tony! It’s cool to hear you’ve used brushes in the past too. Oh, I am glad I am not the only one obsessing over dust – it can be a deal breaker, indeed! I found two possibilities lately which I would like to share: Similar to the make-up brushes, there are also brushes meant for dusting lenses. They seem to be ‘anti-static’ which might be an interesting aspect when shooting plastic toys. Additionally I came to be a big fan of those small rubber bellows that have a small air nozzle (also for dusting lenses and sensors): You can carefully adjust the air stream you need – well, I blew my heroes offthe set the first time I used it, but it’s really not that difficult. And an aside: I used an old long play record just the other day. It drove me crazy because every bit of dust in the room would rush towards the surface and just stay there! It took quite a bit of photoshopping to get a (halfway) clean picture. That’s an interesting idea about the anti-static brushes, I’ll have to try those out. I know a lot of people in the community that use the rubber bellows, but I have yet to try them out myself. I’ve always worried that the air will just move and mess up my shot. Though I suppose there’s a learning curve. Thanks for the ideas James! I’ve tried brushes in the past but I found they left fibers (bristles?) behind on my minifigs so I still ended up doing a lot of post processing work. Maybe I used the wrong brushes, I’ll have to try the ones you recommend. In the mean time, I always use my Giotto Air Blower and I have good luck with it, although I still do a lot of clone stamping – especially on closeup shots. Thanks Lynn! You’re right, the brushes do sometimes leave bristles, which can be incredibly frustrating since it totally negates the point. I still end up doing a lot of post-processing work too, even with the brushes. 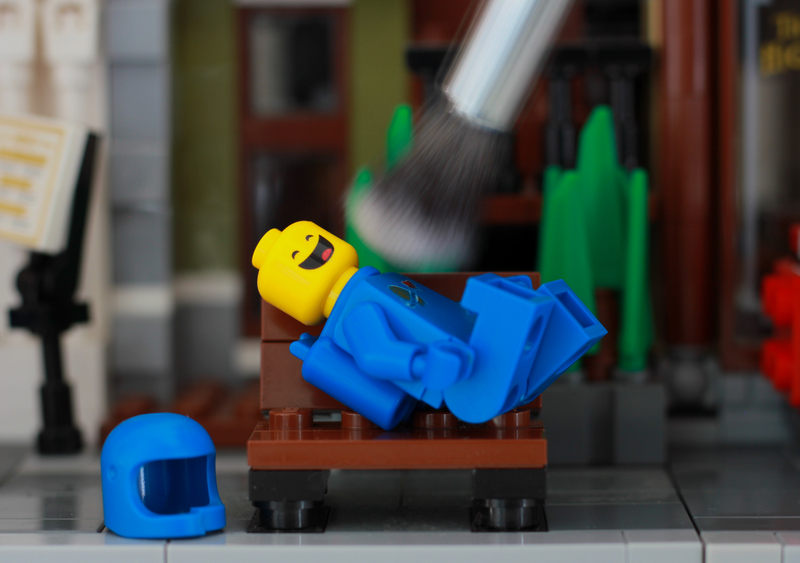 I think that’s just par for the course when shooting LEGO! Great tip. I always think my mini figs are clean till I get them up on the screen. Aaaah!! Photoshop is my friend then. I’ll have to remember to pack some brushes for the next shoot. Might save a bit of time editing.